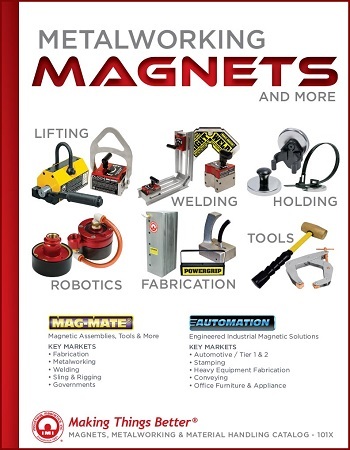 For Immediate Release: Posted On 1/29/2018 By Industrial Magnetics, Inc.
Industrial Magnetics, Inc.(IMI) has published a new 44 page, full color catalog featuring "Magnets for Holding, Lifting, Fixturing, Fabrication, Welding and More". The catalog includes over 40 new products for increasing the speed, efficiency & safety of material handling operations involving metal. New product offerings include magnetic squaring arms for press brakes and shears, a full line of magnetic holders for welding torches, grinders, air tools, cups and spray guns, adhesive backed cup magnets and the addition of 52 MgOe raw magnet material. The catalog is available to download from the media page of the company’s website, or a hard copy can be requested by calling 888.582.0822.